He was born in Unannovu village of Lachin region on the 11th of June, 1952. He finished Unannovu village secondary school in 1969. Israfil started serving in the Soviet Army in 1971 and was demobilized three years later. He started his career as a militiaman within Lachin region Department of Internal Affairs in 1975. When the enemy started attacking the Motherland with their vicious plans, Shahverdiyev Israfil was amongst the ones who stood in the defense of the country as a police officer. He was an active fighter, who helped in many operations that involved the capture and disarm of many enemy spies. He had a special role in the capture of two armenian spies that were trying to trespass our territory through Galadarasi village. Israfil was also actively involved in the capture of the bandits and terrorists that attacked Salatin Asgarova. He drew up a plan in order to clean Galadarasi village from Armenians in 1991. In the battle that lasted all night long, Armenian militants faced a very strong resistance and were forced to retreat. Israfil Shahverdyev together with his battalion was also a participant of the bloody battles for the sake of Hojaz heights and Hojaz village. The bloody battles took place from 19th of September till 17th of November 1992. He showed a great courage as a very experienced scout and soldier. January the 6th…1994…His battalion entered the battle in order to release the villages of Fuzuli region from the enemy invasion. The battalion liberated not only Horadiz settlement but also 4 other villages. The last battle of the brave commander took place on the 13th of January, 1994. The battalion attacked the enemy from several directions and the enemies were completely ruined. The resistance of the enemy was about to be broken. The brave commander took the charge and started fierce attack with the machine gun against the enemy in order to help the wounded soldiers to leave the battlefield safely. But the missile from the enemy direction put an end to his life. 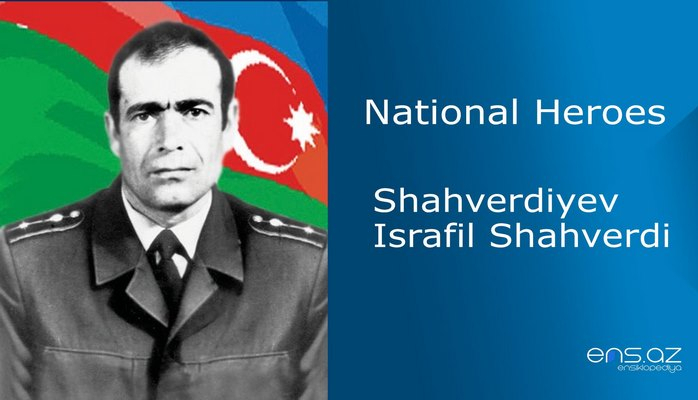 Shahverdiyev Israfil Shahverdi was posthumously awarded the title of the “National Hero of Azerbaijan” by the decree 262 of the president of Azerbaijani republic on the 15th of January, 1995. He was buried in the Alley of Martyrs in Baki city. One of the schools in Lachin region is named after the hero.